Creating Ambassadors Through Digital Media: reflections from the Sandby borg project. Papmehl-Dufay and Söderström. Internet Archaeol. 46. Public archaeology has changed and evolved rapidly as a result of recent digital and technological development. Digital technologies today offer archaeological communities, organisations and individuals around the world the potential to access, produce and share a wide variety of content and previously privileged information. It can also invite and facilitate public participation to a much greater extent than before (Bonacchi 2012; Richardson 2013). This seemingly poses endless new possibilities for the archaeological discipline to engage with its audience and vice versa. 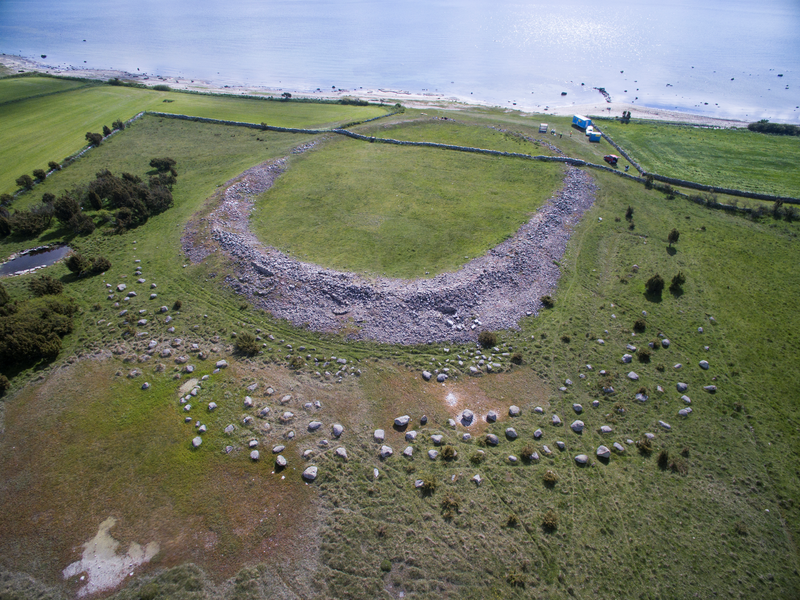 In this article, we present some experiences from the ongoing Sandby borg research project (see below), run by archaeologists at Kalmar County Museum and dealing with the Iron Age ring fort of Sandby borg on the island of Öland in south-east Sweden. Here, digital possibilities for conducting public archaeology have proven invaluable. The character of the discoveries made at the site attracted local, national and international media. The site was often referred to as Sweden´s Pompeii by the media (e.g. Daily Mail) and quickly gained the interest of scholars and the public alike. Alongside this, the local community started to raise concerns that the attention would turn the secluded and serene site into a large-scale tourist destination. Therefore, finding a way of collaborating with the local community in a way that could be beneficial to all stakeholders became crucial to the research and excavation project (e.g. Watson and Waterton 2010). A goal was to get the local community involved in the project to show how the cultural heritage and storytelling of Sandby borg could benefit the community directly, for example by contributing to public values such as social cohesion in the adjoining area. Another important step was to secure further financing so that the excavations conducted by the County Museum could continue. These challenges were addressed via two separate projects in which digital media was used to different extents: the Culture for Children programme and the crowdfunding project. In this article, we will present some of the experiences and insights from these two projects. Also, we will share some reflections on the topic of digital engagement in public archaeology. The island of Öland is situated off the Swedish east coast, in the Baltic Sea (Figure 1). It is the smallest of the administrative Landskap regions in Sweden, yet prehistoric remains are abundant and include some of the most spectacular finds in the country. The mid-Iron Age in particular (c. AD 1–500) was characterised by a relatively large population and extensive long-distance contacts. Visible remains from this period include more than 1,000 stone house foundations and innumerable accompanying stone fences, thousands of cemeteries and graves and at least 15 ring forts (Fallgren 2006; 2008). To this should be added numerous finds of prestigious and exclusive artefacts from the period, including Roman glass beakers, bronze statuettes, weapons and, not least, Roman gold coins. 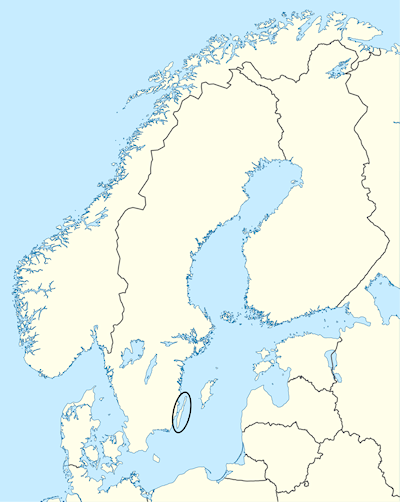 Around 360 solidi are known from the island, which is more than from any other region in Scandinavia (Fagerlie 1967; Herschend 1980; Fischer 2010). The Sandby borg project started in 2010 when five caches of top quality migration-period jewellery were found in the Iron Age ring fort of Sandby borg on Öland, south-east Sweden (Figure 2) (Fallgren and Ljungqvist 2016). The survey resulting in the finds was initiated by the local authorities after suspected looting of the site was reported. The jewellery finds triggered many questions, and by the following year small-scale excavations began. These first excavations were limited to small areas in connection with the jewellery caches, mainly aimed at investigating their context of deposition. In sharp contrast to the high-quality artefacts, however, human remains were encountered on the floor level of several houses in the fort. This, of course, led to new questions. The continued excavations gradually revealed the remains of a violent massacre in the late 5th century, where the victims were left unburied (Gunnarsson et al. 2016a). Excavations have continued annually, initially on a small scale but, from 2016 onwards, on a somewhat larger scale. Today, the project has evolved into a large-scale multi-disciplinary research project headed by Kalmar County Museum, in cooperation with Stockholm University and Linnaeus University. The archaeological situation at Sandby borg is unusual in many respects. The sequence of events has produced a level of detail rarely seen, where a single event has resulted in an abundance of archaeologically detectable traces. This, together with the fact that the site was abandoned after the massacre and never reused, gives the whole site a 'frozen moment' character, resulting in the unique preservation of not only the massacre but also traces of everyday life. The scientific potential of the material is considerable, as is the emotional power of the narrative produced by archaeological excavations at the site. As the potential of the site was realised, so the public interest in the excavations also rapidly increased. A website and a Facebook page were started in 2013. Especially during excavations, these have been used on a daily basis as forums to communicate with the public on the archaeology of the site. The Facebook page has steadily grown in terms of followers, who, at the present, exceed 3,000 people from 45 different countries. In 2016, the website was given a brand-new design, including several interactive features to enhance communication with public audiences. One such feature is the interactive GIS map, where finds and features documented at the dig are instantly made available on the website with pictures and scientific information. From 2014 onwards, guided tours of the dig have been offered regularly during excavations. In addition to this, customised tours have been available on request against payment, and specific target groups have been approached with an offer of special arrangements. An example of the latter relates to an excavation carried out in September 2014, when archaeology students from Linnaeus University in Kalmar got the chance to spend their first two weeks as field archaeologists at Sandby borg. The experience was captured not only in a written report (Papmehl-Dufay and Alfsdotter 2016) but also in a 30-minute documentary made available on YouTube the following spring. This excavation was also the subject of a special public archaeology programme designed for local school groups and children. The programme also entailed interaction between school pupils and university students. The latter were invited, as part of their professional training, to reflect upon issues concerning the significance of archaeology to the local community, with special emphasis placed on communication directed towards children. Among the archaeological results from the 2014 student excavation at Sandby borg, the skeleton of an old man stands out as particularly intriguing. His body was found lying stretched out across the large fireplace in the excavated house, with evidence of burning in the pelvic area. Judging from taphonomic observations, it is likely that the man received a massive blow to the head and fell into the hearth, which was evidently lit at the time, and that he was instantly killed (Figure 3). This find turned out to have a strong ability to reach out and trigger visitors' imagination. On the other hand, it put the public archaeology directed towards children to the test: how do we talk to children about such horrible things? Initially, the project was funded by the Archaeology Department at Kalmar County Museum. This in fact was one main reason for the project to engage in public archaeology. Through public outreach, the idea was to spread the word about the project and raise enough attention to pave the way for future government funding and continued permissions for further excavations from the County Administrative Board. The approach could be related to the public relations model identified by Cornelius Holtorf, where public archaeology is used to 'win the hearts and minds of large sections of the population' (Holtorf 2007, 155). Indeed, the Sandby borg project gained many devoted followers right from the start and the increasing interest from local media and people in general soon revealed the need for developing a strategy for communicating with the public. Connecting with the local community was identified early on as especially important in reaching out and raising support for the project. The attention from media and digital communities had started to affect residents because of the increasing number of visitors travelling to Sandby borg. On the one hand, the attention the project attracted would benefit and promote local business and tourism. On the other hand, concerns were expressed by landowners and locals that the ring fort and the surrounding area, an idyllic and beautiful landscape right by the ocean and hitherto used for recreation, would now be exploited for commercial purposes. Furthermore, the increased number of visitors highlighted issues such as road capacity, limited parking and other facilities, etc. The area is currently used for agricultural purposes and any tourist activities need to be adapted in order not to constitute an obstacle for farmers. These challenges formed the baseline against which project-related public initiatives would be undertaken. We needed to target the local community, with the primary aim of letting people explore the history of Sandby borg and their own part in the construction of cultural heritage values in the area. Reaching out to local children was regarded as particularly important in this respect. Culture for Children is a national programme, funded by the Swedish state through the Swedish Arts Council, with the aim of letting schoolchildren meet and engage with professionals from the world of culture. In the case of Sandby borg, this provided a unique opportunity both to work with the local community and spread the word about the research project to new target groups, by engaging young people in some of the broader questions that had arisen during the excavations. Awareness of [children's] own cultural heritage and participation in the common cultural heritage provides a secure identity which is important to develop along with the ability to understand and empathize with others and their values. Taking the above passage into account, it became obvious that the programme had to be designed to embrace and develop the everyday relationship that the local community had with local heritage. It was also essential to avoid creating a gap between us as researchers and the children by imposing interpretations and results from the excavations at Sandby borg as basic truths (see Waterton 2005; Holtorf 2007, 150ff; Avrami et al. 2000; Eriksson 2014). Therefore, the project was designed to allow the students to work with questions about Sandby borg that could be linked to their own reality. The programme was designed in 2013, and financed and launched in September 2014. Students started with a field visit to the ring fort, followed by an encounter with archaeologists that took place in their classrooms. The activity ended with all classes gathering at the school for a final exhibition the following spring. For younger pupils (grade F–2, 6–8 years), the programme was built around the concept of time as well as the objects found at Sandby borg. These pupils were encouraged to think about what they would choose to hide if they had to leave their own homes and family in a hurry. Also, each class was asked to design a time capsule of their own to be buried on the school grounds during the spring term exhibition. Ironically, however, the time capsule could not buried, owing to the restrictions connected to ancient remains present on the school property. However, the capsules were put on display at the exhibition. The second group of students (grade 3–4, 9–10 years) focused their work around the concepts of long-distance travel and communication. The students were encouraged to look at the objects found at the excavation site and to talk about the contacts with other cultures and languages that the inhabitants of Sandby borg might have established when trading goods with people that came sailing to the island — something that the artefacts indicate. To connect with the curriculum effectively, one of the main issues to be addressed was that of values, that is of how people from other areas and cultures were welcomed when they came to Sandby borg compared to migrants coming to Öland today. The last group, grades 5–6 (11–12 years), were invited to re-evaluate the results of the excavations, by sifting soil coming from the layers of an excavated house, in order to identify the finds that archaeologists had missed. Furthermore, pupils processed what 'experts' said they knew about the events that took place 1,500 years ago. During the classroom visit, discussions focused on questions around values and violence: what sort of conflicts have we experienced? What can be done to prevent them from escalating and what conflicts could possibly result in such a violent sequence of events as the one documented at Sandby borg. This discussion led to a follow-up debate on how to be a good friend and how to be respectful to others. 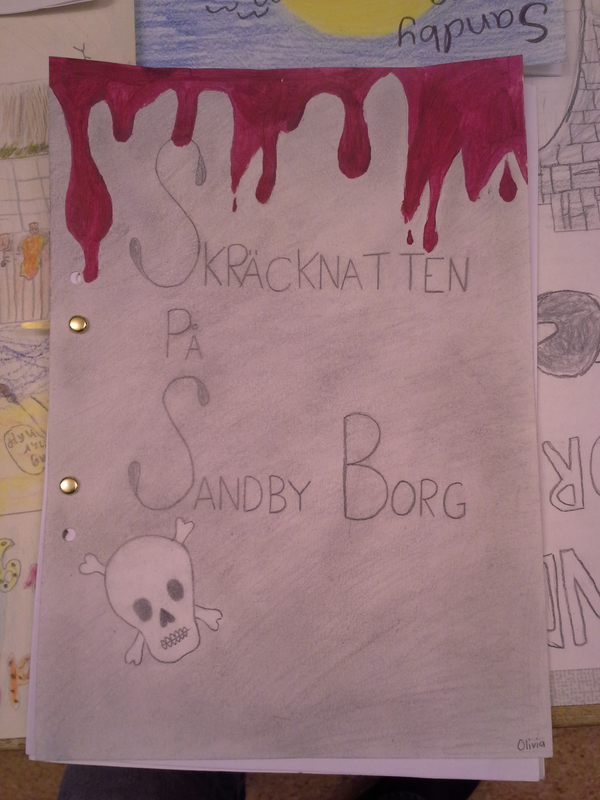 As a final task the students were asked to continue the storytelling of Sandby borg, exploring what actually happened during and after the massacre. The programme ended in December 2014 and the material and stories produced by the 140 participating students were put on display at the school. Their storytelling was also incorporated in a digital application launched by Kalmar County Museum in 2016 to facilitate experiences of the ring fort and present the story of Sandby borg via web, phone or tablet (a brief presentation of the project is given below). Although no formal evaluation of the project was made, some effects and benefits to the project itself and to the local community could still be identified. One effect that was revealed in the informal interviews made with the participating students and teachers was that they seemed to have developed a sense of responsibility towards the ring fort and its future well-being; some of the respondents mentioned that this was 'their monument and a school heritage site that needed to be taken care of'. Also, self-evident as it may seem, many of the young participants also claimed that they were eager to take their family and friends to Sandby borg, to show them the site and tell them about its history and the project (personal comments from participants during the final exhibition, 3 December 2014). Furthermore, the informal interviews revealed that some of the participants brought with them the folklore stories about Sandby borg that their parents, grandparents and other relatives had told them prior to their engagement in the school project (e.g. Breen et al. 2015). Some of these narratives, such as the one about the ring fort being a dangerous place to visit alone, has since then been confirmed by other local inhabitants in the area. This was one of the main benefits for the research project itself: becoming aware of the local stories about Sandby borg that had been constructed and passed on for decades or perhaps even centuries. These initial findings led to a subsequent research project launched in 2016 that aimed to explore the use of such stories in public mediation (Gustav Wollentz pers. comm.). Certainly, the benefits of creating ambassadors for cultural heritage through collaboration with local communities needs further exploration and discussion. The Culture for Children project connected to Sandby borg only illustrates this in part. The main benefit for the research project was that the children who participated helped 'spread the word' about the projects' scientific value, primarily by telling stories about the ring fort and the precious and gruesome findings made by the archaeologists to their families and friends. Through these children, the project was communicated as a high profile and exciting and scientific venture, where the local community is deemed an asset. This has become evident through the increased number of locals that now attend and volunteer for the open guided tours and events connected to Sandby borg. Today, when attending lectures or community meetings, many testify that they regularly visit the ring fort 'to make sure that everything is alright' and that no illegal metal detecting is taking place at the site. Another effect has been that the museum has received enquiries from other schools in the area to conduct similar children's projects connected to Sandby borg such as the one that took place in 2014. A challenge facing the Sandby borg research project, besides the financial aspects, was the increased public interest in the excavations, which placed new demands on accessibility and infrastructure. Although the story and findings are on display for the public in a small exhibition at Kalmar County Museum, many people have expressed an interest in visiting the actual site. Here, a conflict arises between increased demand from prospective visitors on the one hand and limited accessibility to the site on the other. Additionally, current land owners have occasionally perceived growing tourism around the site as a problem. The question of poor physical accessibility often came up in discussions with the children that participated in the Culture for Children programme, especially when they spoke of their grandparents. In an effort to make the ring fort and the archaeological results accessible to a wider public, various digital solutions have been utilised (Gunnarsson et al. 2016b). In cooperation with the Swedish Exhibition Agency and the Halland Cultural History Museum, two web applications were produced in 2015. One of these applications has focused on the site and takes visitors, using a mobile phone or tablet, on a guided tour among the remains of the ring fort. Through this app, called the Digital Outdoor Museum, visitors can experience storytelling at the site, navigate the 3D model of the fort and of some of the excavated victims of the massacre. The application takes the visitor through house 40, the first fully excavated house in the fort. The second application, Sandby borg and Europe, outlines the story of Sandby borg and its relations to Europe at a time of migrations and great change. Both applications incorporate archaeological interpretations, photographs and 3D-material, to present the site and its chronological and cultural context. After the Culture for Children project, the idea was born to use some of the results of this initiative and include them in the digital presentation, and we hope that this will be possible in the near future. Financing research-based archaeological excavations in Sweden is usually accomplished through grants from various state or private funds and foundations. It is a competitive field, requiring substantial effort during the application phase, with low success rates. In the early stage of the Sandby borg project, numerous applications for funding were submitted without success. In 2014, the Sandby borg project was in a position where additional funding was needed to finish the excavation of a house in the central block of the fort that had been subject to smaller excavations since 2011. Given the large and steadily growing public interest in the project and the excavations, we started to consider crowdfunding, i.e. where usually small amounts of money from large numbers of people are used to finance a project (Mollick 2014). This was a new experience for all of us involved and, possibly, it was the first time that crowdfunding had been used to finance an archaeological excavation in Sweden. Most importantly, it seemed an interesting and potentially rewarding way of inviting the public to participate directly in the project. The campaign was set up on Kickstarter, a large American crowdfunding site that had just started to host Swedish projects. By using this platform, we hoped to be able to reach not only local enthusiasts and Swedish archaeology fans in general, but also an international audience. The goal was to raise money in order to be able to complete the excavation of house 40, and to present the results in a richly illustrated book with readily accessible texts in Swedish and English. The funding goal was set at 400,000 SEK (c. £35,000) and the campaign was run from 28 November to 31 December 2014. To attract a range of different backers, we structured the campaign so that it would have nine different reward levels, from 50 SEK up to 50,000 SEK. Rewards at the lower levels included a Thank you on the website (50 SEK), a postcard with a personal greeting from the project staff (100 SEK), a personal diploma (250 SEK), a specially designed T-shirt (500 SEK) and a box of specially manufactured chocolate from the local company Ölandschoklad (750 SEK). At the higher levels, rewards included a copy of the book produced as a result of the planned excavation (1000 SEK), an exclusive handmade silver copy of an object from the fort (5000 SEK), a VIP day with the project leader including a visit to the site and in the museum vaults (15,000 SEK), an exclusive weekend on Öland at Halltorp Inn (25,000 SEK) and, finally, joining us in the trench (50,000 SEK). In total, 321 backers supported the project on Kickstarter, allowing us to collect c. 465,000 SEK. In addition to this, some 50,000 SEK was donated through other means and outside the Kickstarter platform. 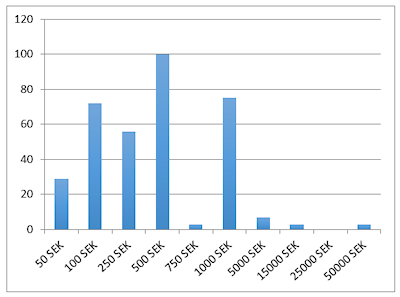 The distribution of backers on different reward levels is shown in Figure 5. Initially, we witnessed a prevalence of small donations. However, a surprisingly high number of sponsors chose the reward levels of 500 or 1000 SEK, and several people chose to sponsor the project at even higher levels. Notably, three people from a single family in Boston, US, donated 50,000 SEK each and were thus invited to take part in the excavations; two of them joined us for a week on Öland in early June 2015 (Figure 6). It should be noted that without this more substantial kind of support, the goal of 400,000 SEK would have not been reached and the project would have not been successful. Of the total number of backers (321), 230 were Swedish and most of these were not from the local area (see Figure 7). Figure 7 shows that the majority of our non-Swedish backers were based in the US, which was probably a consequence of choosing the American platform Kickstarter. However, the second largest non-Swedish backer country was Great Britain, followed by Canada. 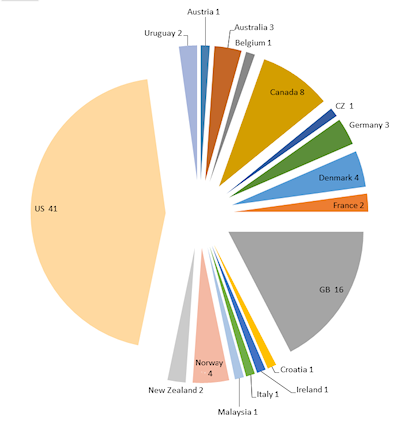 Only a handful of backers came from Nordic countries, Germany, Australia and France. Clearly, the project managed to appeal to people in different ways that were not dependent on proximity and personal relations. Using crowdfunding to finance a research project like Sandby borg was a rewarding and exciting experience. The people who got involved in the project and pledged money to support the excavations were of all ages, from parents donating in their children´s names to local history activists in their eighties. To some extent, it could be said that crowdfunding is a way to co-produce archaeology, especially when the archaeology that is performed would have not taken place without the money donated by the public as in the case of Sandby borg. A useful lesson was that different people prefer different ways of supporting a project. The Kickstarter platform is a website, seemingly easy to access and user-friendly. Through it, we managed to gather some 321 backers from 18 countries and a total sum of c. 465,000 SEK. However, a not insignificant amount of money was donated directly to our bank account or sent by cheque within the timeframe of the crowdfunding campaign, but independent of the Kickstarter platform. Typically, these backers had seen the web page, had often watched the short introductory film, but then got discouraged when it came to paying online. The reasons for going 'off the grid' in this way could be many, of course, but in several cases it was clear that the bank account sponsors were elderly people who were uncomfortable with online payment or the login procedures involved in using the Kickstarter platform, and therefore chose to send money in a more traditional way. We decided early on, whenever possible, to treat these donations in the same way as the Kickstarter ones and use the same reward levels. However, in some cases this proved difficult since only the name of the backer, sometimes only the first name, was provided through the bank account donations. One may reflect on who was reached by the campaign and who was not. Some people not entirely comfortable with online crowdfunding still managed to find a way to support us. However, an unknown number of people who lack access to the internet altogether would never hear about our campaign. To address this issue, other ways of involvement should be planned in the future. 5. Digital Engagement with Public Archaeology: fostering democracy or creating social inequalities? That digital public archaeology provides opportunities for a highly personal interaction with the past for a potentially (nearly) worldwide audience is widely acknowledged today. However, the debate on digital media in public archaeology has highlighted several critical aspects that may curb the potential of using participatory technology in the democratisation of archaeology (Matsuda and Okamura 2011; critique e.g. Richardson 2013; Bonacchi and Moshenska 2015). It has been argued that although the use of web-based methods to disseminate archaeological knowledge as well as for communicating with the interested public is celebrated for its potential to liberate and democratise the discipline, we still know very little about its actual impacts (Perry and Beale 2015, 155). The democratising powers of new digital media are still hindered by the unequal means, skills and knowledge that are needed to get involved (Bonacchi 2016). In a way, our projects respond to these suggestions that digital engagement is problematic. We have seen that accessing and taking part in digital archaeology projects and activities online, whether it is via a webpage or social media, requires a certain kind of digital literacy that is dependent on the individual user's motivation and context. As shown by the crowdfunding project, there is a significant difference in both digital literacy and skills, even among people that have free access to computers. This is an important aspect to consider when analysing the democratising effects of a digital public archaeology. Certainly, something seemingly accessible to the greatest part of a 'networked society' might very well foster hidden inequalities. A public archaeology that interacts and connects with its audience through the internet will not automatically guarantee full-scale participation and involvement. In the case of crowdfunding projects, an issue that is often highlighted is that of a 'digital divide', something that, in our project, we managed to overcome by being flexible in the approach we adopted towards the people who wanted to contribute but, for various reasons, preferred doing so 'off the grid'. The solution was to allow more traditional payment methods, while regarding and rewarding these sponsors in the same way as the ones who used digital media. In conclusion, we argue that archaeologists must consider the great heterogeneity of the 'public' in public archaeology, without forgetting that this is even more important when it comes to engaging and involving people through digital media. 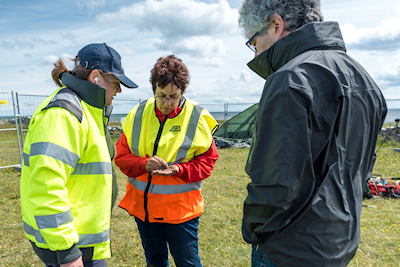 The cases we have presented in this article illustrate the need to continually develop face-to-face interaction and physical communication in public archaeology to make sure that archaeological outreach programmes evolve in step with technological developments. To progress, further research on the actual effects of a digital public archaeology must also be undertaken.